In a ballroom almost next door to LAX, 90 or so innovators, all recent grantees of the National Institutes of Health, gathered for a commercialization workshop organized by Larta Institute. This two-day workshop, which we have named the Commercialization Training Workshop (or CTW), is one of the first steps our participants take in the NIH Commercialization Accelerator Program (CAPs) to develop their own entrepreneur’s toolkit. Larta has organized and led CTWs every year since 2003 when we first won the contract with NIH. As one might expect, the CTW covers the gamut of issues associated with the growth of entrepreneurial companies, from market and customer development to funding and financial planning, from marketing to communicating the strategy to external parties. This year, we also featured a panel focused on the truths and misconceptions of partnering, a crucial consideration for emerging companies in charting their progress to commercialization. “Partnerships are critical in today’s marketplace. No company is an island, and establishing market readiness is dependent on flexible partnership planning,” says Rohit Shukla, CEO of Larta Institute. As the Program Director for the National Institutes of Health, Commercialization Accelerator Program, (NIH CAP) at Larta, I have seen participants come inevitably to this realization. As newbies to the field, they do not know where to start. One of the most asked questions and concerns from our entrepreneurs is: how do I begin searching for the right partner? In this year’s CTW, two of Larta’s senior Principal Advisors shared their experience and wisdom in regard to the daunting task of choosing the right partner for your company. The panel was led by Bruce Halpryn, who has over 30 years of commercialization experience as the former Senior Director for Technology Development, IP, and Technical Due Diligence for Proctor and Gamble. Joining Bruce was Kimberly Rogers, who has 20 years of commercialization experience and was a former Vice President of Technology Assessment at Allergan. Below I have culled the nuggets from their presentation to share with you. Identify and understand your contribution, and what your potential partner can bring to a partnership. One of the most important steps when you begin your partner search is to identify and understand your innovation’s value and strength. Small companies tend to think they don’t have much to offer in a partnership, when in fact, they often are agile risk takers who offer disruptive technologies. These attributes have the effect of refreshing tired corporate models. Big companies have the ability to bring investment resources, well-characterized market channels, and sales and marketing power. They also have an intimate knowledge of supply chains or have the ability to scale up equipment or engineering, or scale manufacturing and operations. Know what you need from a partner. Below is a “key capability” table that helps startups begin to assess their company’s gaps. The chart will tell you right away if your potential partner is a good match. If their capabilities fill in the blanks you need, you are on the path to a good potential match. This can include a wide range of partnerships, including service agreements, licensing technology, license IP, joint development, joint venture, supply agreement (technology), supply agreement (finished products), royalty agreement (brand equities out), and royalty agreement (brand equities in). 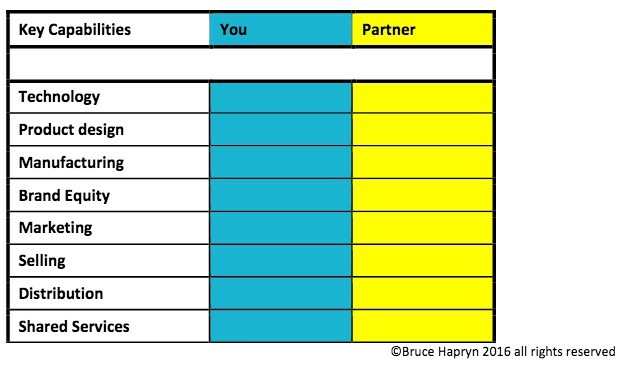 Discover the structure of the partnership Each party brings individual and functional skills, but when looking at partners, you must focus your corporate lens.The spectrum graph below helps determine the duration of the partnership you need, and ways to align your strategies. It also shows how to align strategies based on the partnering structure. For instance, a service structure, such as consultancy, will have a shorter time-frame in terms of both service and revenue.Finding a win-win on the spectrum focuses your approach to deal making. Remember, success is not a single endpoint. It’s a journey marked by forward motion and multiple partnerships that help you along the way. Honesty is the best policy when negotiating a partnership “Focus on the golden anniversary, not just the marriage.” – Bruce HalprynIdentify risks and opportunities up front. Be open and acknowledge unknowns. Respect each other’s views by creating balanced rewards as risks are reduced and project value is created. Be honest and forthcoming. It is important to be up-front about potential risks, and your plan to weather risks with your potential partner as anticipated. Align each party to seek solutions. Seek collaborative paths forward. Craft deal terms that incentivize mutually desired behavior. Listening is key to successful deal making Stubborn mental models are to blame for countless business failures and missed opportunities. Leveraging new knowledge and connections are key to new breakthroughs. – Bruce HalpyrnYour potential partners will certainly have “must have’s” Listen to what they have to say. Look through their lens. How do you think they arrived here, interested in you? Understanding your potential partner’s needs comes from listening to them, and will help you customize your pitch. Be passionate Everybody’s baby is beautiful. It’s OK to show emotion about your innovation. Communicating what fires you up about your innovation helps build relationships. As we know so well at Larta, relationships are a cornerstone of doing business, especially for small, self-made inventors. Judy Hsieh is Program Director for Larta Institute’s bioscience practice. She leads the team in charge of setting strategic directions, planning, development, and execution of various Commercialization Accelerator Programs (CAPs), funded by US and foreign government agencies. The Commercialization Accelerator Programs help entrepreneurs accelerate their market readiness. Judy also provides a range of process improvement and process management to ensure cross-pollination and best practices to enhance the programs team. Judy has been part of the Larta team since April 2008. Prior to joining Larta she worked on corporate strategic initiatives at Kaiser Permanente. Judy has a Masters degree in Business Administration, with a concentration in Leadership and Organization Change Management from Pepperdine University, and an undergraduate degree in Biology from the University of Redlands.